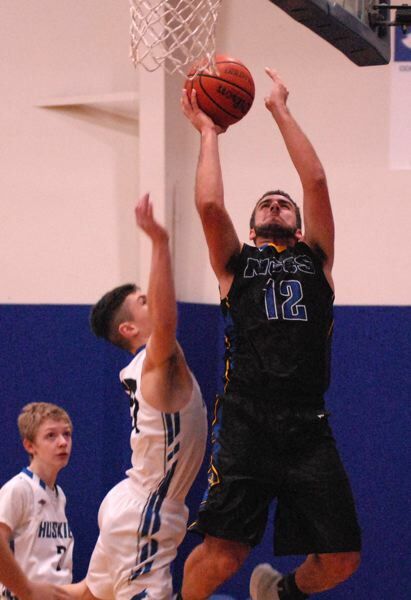 The game started well for the Open Door Huskies, then Valley 10 contender North Clackamas Christian got hot from 3-point range to spark a 62-36 win for the visitors from Oregon City. Open Door relied on its speed to put the first points on the board with Erik Rudenko grabbing a rebound and firing a quick outlet pass to guard Johnny Cristurean, who zipped down the sideline for a layup. He got loose again moments later with teammate Reno Mikityuk filling the lane on the far side, leaving the defender in no man's land. Cristurean attacked the hoop for two more points. With their long-range shots missing the mark, North Clackamas sent the ball inside for a 12-point spurt to gain a lead that it would never surrender. "It didn't matter if the shots came from inside or out, we just passed the ball around until we found something good," Saints' senior Jake Van Lieu said. All five North Clackamas buckets in the first quarter came within five feet of the hoop. Open Door stayed within striking distance with Cristurean converting a three-point play at the end of the first quarter. Teammate Alex Kim started the second with a spin into the middle before twisting back the other way to slip past his defender and reach the rim for two points. The Huskies followed with a long possession that included a dizzying number of handoffs outside the arc. Eventually, Cristurean found himself in the corner in front of the visitor's bench. He faked a pass toward the center of the court, and instead sent a perfectly-placed bounce pass along the baseline into the hands of Erik Rudenko for an easy two off the glass to bring Open Door within 16-15. That's when the Saints caught fire. Luke Nelson hit the team's first 3-pointer more than 10 minutes after the opening tip, and Caleb Matias swished one from the corner on the team's next trip. The Saints would nail four long balls in the second quarter and four more in the third on their way to a 30-point lead. "Just keep shooting and eventually they are going to go in," Nelson said. "Once they did, it gave us all the momentum." Open Door (4-4) plays at Life Christian at 7:30 p.m. Saturday. 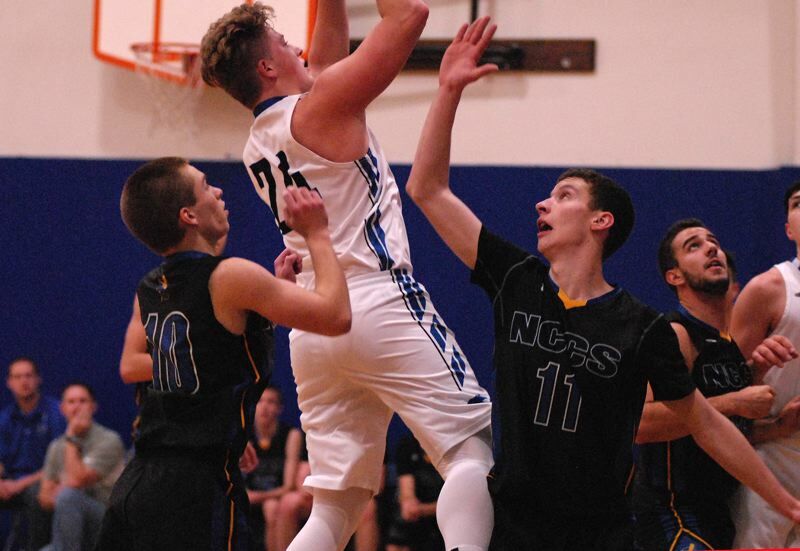 North Clackamas Christian (62) — Luke Nelson 11, Jake Van Lieu 11, Caleb Matias 10, Isaac Minne 10, Braden Young 10, Hadden Stark 6, Jeremy Horn 2, Cody Smidt 2. Open Door Academy (36) — Vitaliy Maftey 15, Johnny Cristurean 11, Erik Rudenko 4, Reno Mikityuk 2, Alex Kim 2, Danny Hernandez 2, Sima, Yurko, Stamper, Visan.